For assistance with IPA transcriptions of Norwegian for Wikipedia articles, see Help:IPA/Norwegian. The sound system of Norwegian resembles that of Swedish. There is considerable variation among the dialects, and all pronunciations are considered by official policy to be equally correct - there is no official spoken standard, although it can be said that Bokmål has an unofficial spoken standard, called Urban East Norwegian or Standard East Norwegian (Norwegian: Standard Østnorsk), loosely based on the speech of the literate classes of the Oslo area. This variant is the most common one taught to foreign students. Despite there being no official standard variety of Norwegian, Urban East Norwegian has traditionally been used in public venues such as theatre and TV, although today local dialects are used extensively in spoken and visual media. The background for this lack of agreement is that after the dissolution of Denmark–Norway in 1814, the upper classes would speak in what was perceived as the Danish language, which with the rise of Norwegian romantic nationalism gradually fell out of favour. In addition, Bergen, not Oslo, was the larger and more influential city in Norway until the 19th century. See the article on the Norwegian language conflict for further information. Unless noted otherwise, this article describes the phonology of Urban East Norwegian. 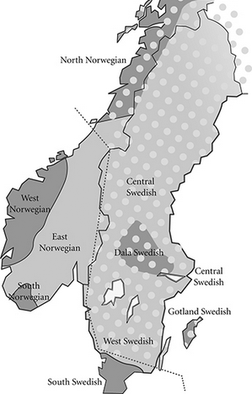 The map shows the extent of palatalization of long dental/alveolar consonants in Norway. /n, t, d/ are laminal [n̻, t̻, d̻], either alveolar [n, t, d] or denti-alveolar [n̪, t̪, d̪]. /p, t, k/ are aspirated fully voiceless [pʰ, tʰ, kʰ], whereas /b, d, ɡ/ are unaspirated, either fully voiceless [p˭, t˭, k˭] or partially voiced [b̥˭, d̥˭, ɡ̊˭]. After /s/ within the same syllable, only unaspirated voiceless stops occur. /s/ is dentalized laminal alveolar [s̪] or (uncommonly) non-retracted apical alveolar [s̺]. /ʂ/ is pronounced with protruded lips [ʂʷ]. The degree of protrusion depends on the rounding of the following vowel. /h/ is a (usually voiceless) fricative. The friction is normally glottal [h], but sometimes it is dorsal: palatal [ç] when near front vowels, velar [x] near back vowels. It can be voiced [ɦ ~ ʝ ~ ɣ] between two voiced sounds. /ʋ, l, j, ɾ/ are partially voiced or fully voiceless [f, l̥, ç, ɾ̥] when they occur after /p, t, k, f/ (but not when /s/ precedes within the same syllable). The flap /ɾ/ is also partially voiced or fully voiceless when it occurs postvocalically before /p, k, f/. /ʋ/ is sometimes a fricative, especially before a pause and in emphatic pronunciation. Kristoffersen (2000) states that /j/ is sometimes a fricative. Vanvik (1979) states that the fricative variant of /j/ occurs often, especially before and after close vowels and in energetic pronunciation. /l/ is in process of changing from laminal denti-alveolar [l̪] to apical alveolar [l̺], which leads to neutralization with the retroflex allophone [ɭ]. Laminal realization is still possible before vowels, after front and close vowels and after consonants that are not coronal, and is obligatory after /n, t, d/. A velarized laminal [ɫ̪] occurs after mid back vowels /ɔ, oː/, open back vowels /ɑ, ɑː/, and sometimes also after the close back vowels /ʊ, uː/. However, Endresen (1990) states that at least in Oslo, the laminal variant is not velarized, and the difference is only between an apical and a laminal realization. /ɾ/ is an voiced apical alveolar flap [ɾ̺]. It is occasionally trilled [r], e.g. in emphatic speech. Retroflex allophones [ɳ, ʈ, ɖ] have been variously described as apical alveolar [n̺, t̺, d̺] and apical postalveolar [n̠, t̠, d̠]. /ɽ/ alternates with /l/ in many words (in a small set of words also with /ɾ/), but there is a small number of words in which only /ɽ/ occurs. /ŋ, k, ɡ/ are velar, whereas /j/ is palatal. /ç/ may be palatal [ç], but is often alveolo-palatal [ɕ] instead. It is unstable in many dialects, and younger speakers in Bergen, Stavanger and Oslo merge /ç/ with /ʂ/ into [ʂ]. Glottal stop [ʔ] may be inserted before word-initial vowels. In very emphatic speech, it can also be inserted word-medially in stressed syllables beginning with a vowel. Most of the retroflex (and postalveolar) consonants are mutations of [ɾ]+any other alveolar/dental consonant; rn /ɾn/ > [ɳ], rt /ɾt/ > [ʈ], rl /ɾl/ > [ɭ], rs /ɾs/ > [ʂ], etc. /ɾd/ across word boundaries (sandhi), in loanwords and in a group of primarily literary words may be pronounced [ɾd], e.g., verden [ˈʋæɾdn̩], but it may also be pronounced [ɖ] in some dialects. Most of the dialects in Eastern, Central and Northern Norway use the retroflex consonants. Most Southern and Western dialects do not have these retroflex sounds, because in these areas a guttural realization of the /r/ phoneme is commonplace, and seems to be expanding. Depending on phonetic context voiceless ([χ]) or voiced uvular fricatives ([ʁ]) are used. (See map at right.) Other possible pronunciations include a uvular approximant [ʁ̞] or, more rarely, a uvular trill [ʀ]. There is, however, a small number of dialects that use both the uvular /r/ and the retroflex allophones. The retroflex flap, [ɽ], colloquially known to Norwegians as tjukk l ('thick l'), is a Central Scandinavian innovation that exists in Eastern Norwegian (including Trøndersk), the southmost Northern dialects, and the most eastern Western Norwegian dialects. It is supposedly non-existent in most Western and Northern dialects. Today there is doubtlessly distinctive opposition between /ɽ/ and /l/ in the dialects that do have /ɽ/, e.g. gard /ɡɑːɽ/ 'farm' and gal /ɡɑːl/ 'crazy' in many Eastern Norwegian dialects. Although traditionally an Eastern Norwegian dialect phenomenon, it was considered vulgar, and for a long time it was avoided. Nowadays it is considered standard in the Eastern and Central Norwegian dialects, but is still clearly avoided in high-prestige sociolects or standardized speech. This avoidance calls into question the status of /ɽ/ as a phoneme in certain sociolects. According to Nina Grønnum, tjukk l in Trøndersk is actually a postalveolar lateral flap [ɺ̠]. Unless preceding another vowel within the same word, all unstressed vowels are short. In unstressed syllables, /ɛ/ tends to reduce to a simple schwa [ə]. The phonemic status of [æ] and [æː] in Urban East Norwegian is unclear since these pattern as allophones of, respectively, /ɛ/ and /eː/ before the flaps /ɾ/ and /ɽ/. However, there also are words in which /eː/ is realized as [eː] despite the following flap, such as Per [peːɾ] 'Peter'. [æ] also occurs in the diphthongs [æɪ] and [æʉ]. Urban East Norwegian also features a few non-phonemic diphthongs, which are [œʏ, ɔʏ, æɪ, æʉ, ɑɪ]. [œʏ, ɔʏ, æɪ, ɑɪ] can be analyzed as sequences of /œ, ɔ, ɛ, ɑ/ and /j/ which is allophonically labialized to [ɥ] after rounded vowels. [æʉ] can be analyzed as a sequence of /ɛ/ and /w/ (which corresponds to the central [ʉ], not back [ʊ]). The second element of /ɛw/ is often realized as labiodental [ʋ]. Some speakers have an additional diphthong [ɛɪ] in their inventory which, like [ɔʏ] and [ɑɪ], is restricted to loanwords. For such speakers, [æɪ] is best analyzed as /æ/ + /j/, whereas /ɛj/ is the phonemic representation of the marginal [ɛɪ]. Another (very rare) diphthong is [ʉɪ] (phonemically /ʉj/), which appears only in the word hui ('haste'). The following sections describe each monophthong in detail. The vowels /iː, yː, ʉː, eː, ɔ, æ, æː/ as well as the [ə] allophone of /ɛ/ are invariably transcribed with ⟨iː, yː, ʉː, eː, ɔ, æ, æː⟩ and ⟨ə⟩. /uː, øː/ are most often transcribed with ⟨uː, øː⟩, but /uː/ may be transcribed with an obsolete ⟨ɷː⟩ by older sources. In addition, Kristoffersen (2000) uses both ⟨øː⟩ and ⟨ɵː⟩ for /øː/. This article transcribes those vowels with ⟨uː, øː⟩. /oː/ is most often transcribed with ⟨ɔː⟩, yet this article uses ⟨oː⟩, following Kristoffersen (2000). The open back /ɑ, ɑː/ are most often transcribed with ⟨ɑ, ɑː⟩, but Vanvik (1979) transcribes them with ⟨a, aː⟩. This article uses the former set. The short close vowels /ɪ, ʏ, ʉ, ʊ/ are transcribed with either ⟨ɪ, ʏ, ʉ, ʊ⟩ or ⟨i, y, ʉ, u⟩. The short /ʉ/ is occasionally transcribed with ⟨ʉ̞⟩ or a non-IPA symbol ⟨ᵿ⟩ instead, whereas /ʊ/ is transcribed with an obsolete symbol ⟨ɷ⟩ in some older sources. This article uses ⟨ɪ, ʏ, ʉ, ʊ⟩. The short mid front vowels /ɛ, œ/ are transcribed with either ⟨ɛ, œ⟩ or ⟨e, ø⟩. This article uses ⟨ɛ, œ⟩. The close /ʏ, yː, ʉ, ʉː/ have been variously described as protruded [ʏ̫, y̫ː] and compressed [ʉ͍, ʉ͍ː] as well as compressed [ʏ͍, y͍ː] and protruded [ʉ̫, ʉ̫ː]. The backness of /ʉ, ʉː/ has also been variously described as central [ʉ, ʉː] and near-front [ʉ̟, ʉ̟ː]. Therefore, /ʏ, yː/ may be differentiated from /ʉ, ʉː/ by backness and the type of rounding or even only by the type of rounding. The close back /ʊ, uː/ are compressed [ʊ͍, u͍ː]. The mid /œ, øː, ɔ, oː/ are protruded [œ̫, ø̫ː, ɔ̫, o̫ː]. /ɪ, ʏ, ʉ, ʊ/ have been variously described as near-close [ɪ, ʏ, ʉ̞, ʊ] and close [i, y, ʉ, u]. In addition, /ɪ/ and /ʊ/ are more peripheral than the canonical values of IPA ⟨ɪ, ʊ⟩ ([ɪ̟ ~ i] and [ʊ̠ ~ u], respectively). /iː, yː, ʉː, uː/ are phonetically close [iː, yː, ʉː, uː]. /ɛ/ is mid front [ɛ̝]. /eː, øː/ are close-mid [eː, øː]. /eː/ is front, yet /øː/ has been variously described as front [øː] and central [ɵː]. /œ/ has been variously described as open-mid front [œ] and mid central [ɞ̝]. /ɔ/ has been variously described as near-open back [ɔ̞] and close-mid back [o]. /oː/ has been variously described as mid back [o̞ː] and close-mid back [oː]. /æ, æː/ have been variously described as near-open front [æ, æː] and open central [ä, äː]. /ɑ, ɑː/ are open back [ɑ, ɑː]. /eː, øː/ are frequently realized as centering diphthongs [eə, øə]. /iː, yː, uː, oː/ can also be realized as [iə, yə, uə, oə], yet /ʉː, æː, ɑː/ are always monophthongal. However, according to Kvifte & Gude-Husken (2005), the diphthongal variants of /eː, øː, oː/ are opening [eɛ, øœ, oɑ], not centering. Note that contrary to the information in the map, the dialects of Rogaland, Aust-Agder and Trøndelag are not traditionally classified as East Norwegian, but as West Norwegian, South Norwegian and Trøndersk, respectively. Norwegian is a pitch accent language with two distinct pitch patterns. They are used to differentiate polysyllabic words with otherwise identical pronunciation. Although difference in spelling occasionally allows the words to be distinguished in the written language (such as bønner/bønder), in most cases the minimal pairs are written alike. For example, in most Norwegian dialects, the word uttale ('pronounce') is pronounced using tone 1 ([ˈʉːttɑːlə]), while uttale ('pronunciation') uses tone 2 ([²ʉːttɑːlə]). There are significant variations in the realization of the pitch accent between dialects. In most of Eastern Norway, including the capital Oslo, the so-called low pitch dialects are spoken. In these dialects, accent 1 uses a low flat pitch in the first syllable, while accent 2 uses a high, sharply falling pitch in the first syllable and a low pitch in the beginning of the second syllable. In both accents, these pitch movements are followed by a rise of intonational nature (phrase accent), the size (and presence) of which signals emphasis/focus and which corresponds in function to the normal accent in languages that lack lexical tone, such as English. That rise culminates in the final syllable of an accentual phrase, while the fall to utterance-final low pitch that is so common in most languages is either very small or absent. On the other hand, in most of western and northern Norway (the so-called high-pitch dialects) accent 1 is falling, while accent 2 is rising in the first syllable and falling in the second syllable or somewhere around the syllable boundary. The two tones can be transcribed on the first vowel as /ɑ̀/ for accent 1 and /ɑ̂/ for accent 2; the modern reading of the IPA (low and falling) corresponds to eastern Norway, whereas an older tradition of using diacritics to represent the shape of the pitch trace (falling and rising-falling) corresponds to western Norway. Accent 1 generally occurs in words that were monosyllabic in Old Norse, and accent 2 in words that were polysyllabic. In many dialects, the accents take on a significant role in marking grammatical categories. Thus, the ending (T1)—en implies determinate form of a masculine monosyllabic noun (båten 'boat', bilen, 'car'), whereas (T2)-en denotes either determinate form of a masculine bisyllabic noun or an adjectivised noun/verb (moden 'mature'). Similarly, the ending (T1)—a denotes feminine singular determinate monosyllabic nouns (boka 'book', rota 'root') or neuter plural determinate nouns (husa 'houses', lysa 'lights'), whereas the ending (T2)—a denotes the preterite of weak verbs (rota 'made a mess', husa 'housed'), feminine singular determinate bisyllabic nouns (bøtta 'bucket', ruta 'square'). In Eastern Norwegian the tone difference may also be applied to groups of words, with different meaning as a result. Gro igjen for example, means 'grow anew' when pronounced with tone 1 [ˈɡɾùː‿ɪjə́n], but 'grow over' when pronounced with tone 2 [ˈɡɾûː‿ɪjə́n]. In other parts of Norway, this difference is achieved instead by the shift of stress (gro igjen [ˈɡɾuː ɪjən] vs. gro igjen [ɡɾuː ˈɪjən]). In a compound word, the pitch accent is lost on one of the elements of the compound (the one with weaker or secondary stress), but the erstwhile tonic syllable retains the full length (long vowel or geminate consonant) of a stressed syllable. In some dialects of Norwegian, mainly those from Nordmøre and Trøndelag to Lofoten, there may also be tonal opposition in monosyllables, as in [bîːl] ('car') vs. [bìːl] ('axe'). In a few dialects, mainly in and near Nordmøre, the monosyllabic tonal opposition is also represented in final syllables with secondary stress, as well as double tone designated to single syllables of primary stress in polysyllabic words. In practice, this means that one gets minimal pairs like: [hɑ̀ːnɪɲː] ('the rooster') vs. [hɑ̀ːnɪ̂ɲː] ('get him inside'); [brʏ̂ɲːɑ] ('in the well') vs. [brʏ̂ɲːɑ̂] ('her well'); [læ̂nsmɑɲː] ('sheriff') vs. [læ̂nsmɑ̂ɲː] ('the sheriff'). Amongst the various views on how to interpret this situation, the most promising one may be that the words displaying these complex tones have an extra mora. This mora may have little or no effect on duration and dynamic stress, but is represented as a tonal dip. Other dialects with tonal opposition in monosyllabic words have done away with vowel length opposition. Thus, the words [vɔ̀ːɡ] ('dare') vs. [vɔ̀ɡː] ('cradle') have merged into [vɔ̀ːɡ] in the dialect of Oppdal. Some forms of Norwegian have lost the tonal accent opposition. This includes mainly parts of the area around (but not including) Bergen; the Brønnøysund area; to some extent, the dialect of Bodø; and, also to various degrees, many dialects between Tromsø and the Russian border. Faroese and Icelandic, which have their main historical origin in Old Norse, also show no tonal opposition. It is, however, not clear whether these languages lost the tonal accent or whether the tonal accent was not yet there when these languages started their separate development. Standard Danish, Rigsdansk, replaces tonal accents with the stød, whilst some southern, insular dialects of Danish preserve the tonal accent to different degrees. The Finland Swedish dialects also lack a tonal accent; no such phenomenon exists in Finnish. The words ja ('yes') and nei ('nei') are sometimes pronounced with inhaled breath (pulmonic ingressive) in Norwegian. The same phenomenon occurs across the other Scandinavian languages, and can also be found in German, French, Finnish and Japanese, to name a few. The sample text is a reading of the first sentence of The North Wind and the Sun by a 47-year-old professor from Oslo's Nordstrand district. Nordavinden og solen kranglet om hvem av dem som var den sterkeste. ^ Kristoffersen (2000), pp. 6–7. ^ Kristoffersen (2000), p. 7. ^ a b c d Kristoffersen (2000), p. 22. ^ Skaug (2003), pp. 130–131. ^ Popperwell (2010), p. 58. ^ Vanvik (1979), p. 40. ^ Kristoffersen (2000), pp. 75–76, 79. ^ a b c Kristoffersen (2000), p. 74. ^ a b c Vanvik (1979), p. 41. ^ Kristoffersen (2000), pp. 24–25. ^ Kristoffersen (2000), p. 24. ^ Kristoffersen (2000), pp. 24, 90. ^ Kristoffersen (2000), p. 23. ^ Kristoffersen (2000), pp. 22–23. ^ Kristoffersen (2000), pp. 6–11. ^ Grønnum (2005), p. 155. ^ Kristoffersen (2000), p. 13. ^ a b c d Kristoffersen (2000), p. 19. ^ Kristoffersen (2000), pp. 20-21. ^ Kristoffersen (2000), pp. 14, 106. ^ Kristoffersen (2000), pp. 16–17, 19, 25. ^ Vanvik (1979), p. 22. ^ For example by Haugen (1974), Vanvik (1979), Kristoffersen (2000) or Kvifte & Gude-Husken (2005). ^ For example by Vanvik (1979), Kristoffersen (2000) Kvifte & Gude-Husken (2005) and Krech et al. (2009). ^ For example by Haugen (1974). ^ Haugen (1974), Vanvik (1979), Kvifte & Gude-Husken (2005) and Krech et al. (2009). ^ This article uses ⟨oː⟩ because other mid vowels (that is, /eː/ and /øː/) are also transcribed with close-mid symbols. Urban East Norwegian /oː/ is also never as open as [ɔː] as it has been variously described as mid [o̞ː] (Vanvik (1979:13, 17), Kvifte & Gude-Husken (2005:4)) and close-mid back [oː] (Kristoffersen (2000:16–17)). ^ For example by Haugen (1974), Kristoffersen (2000), Kvifte & Gude-Husken (2005) and Krech et al. (2009). ^ Sources that use ⟨i, y, u⟩ include Haugen (1974) and Vanvik (1979). Kristoffersen (2000) also uses ⟨i, y, u⟩, but admits that ⟨ɪ, ʏ, ʊ⟩ is just as correct a transcription (see p. 11). Sources that use ⟨ɪ, ʏ, ʊ⟩ include Kvifte & Gude-Husken (2005). Some sources mix these sets, e.g. Krech et al. (2009) uses ⟨i, ʏ, u⟩. The short close central vowel is transcribed with ⟨ʉ⟩ by most sources, but Krech et al. (2009) use a non-IPA symbol ⟨ᵿ⟩. Kristoffersen (2000) also mentions ⟨ʉ̞⟩ as a possible transcription. Sources that use ⟨ɷ⟩ for /ʊ/ include Haugen (1974). ^ Sources that use ⟨e, ø⟩ include Vanvik (1979). Sources that use ⟨ɛ, œ⟩ include Kristoffersen (2000) and Kvifte & Gude-Husken (2005). Some sources mix these sets, e.g. Haugen (1974) uses ⟨ɛ, ø⟩ whereas Krech et al. (2009) uses ⟨e, œ⟩. ^ Kristoffersen (2000), pp. 15–16. ^ a b Haugen (1974), p. 40. ^ Kristoffersen (2000), p. 16. ^ Vanvik (1979), pp. 13-14, 18-20. ^ a b c d e Kvifte & Gude-Husken (2005), p. 2. ^ Vanvik (1979), pp. 13-14, 18. ^ Vanvik (1979), pp. 13-14, 17-19. ^ a b c d Kvifte & Gude-Husken (2005), p. 4. ^ a b Vanvik (1979), pp. 13, 15. ^ Vanvik (1979), pp. 13-14. ^ a b c d e Kristoffersen (2000), pp. 16–17. ^ a b Kvifte & Gude-Husken (2005), pp. 2, 4. ^ Vanvik (1979), pp. 14, 17, 19-20. ^ Strandskogen (1979), p. 16. ^ Kvifte & Gude-Husken (2005), pp. 4–5. ^ Gussenhoven (2004), p. 89. ^ Kristoffersen (2000), p. 184. ^ "Nordavinden og sola: Opptak og transkripsjoner av norske dialekter". ^ Source of the phonetic transcription: "Nordavinden og sola: Opptak og transkripsjoner av norske dialekter". Haugen, Einer (1967). "On the Rules of Norwegian Tonality". Language Vol. 43, No. 1 (Mar., 1967), pp. 185-202.